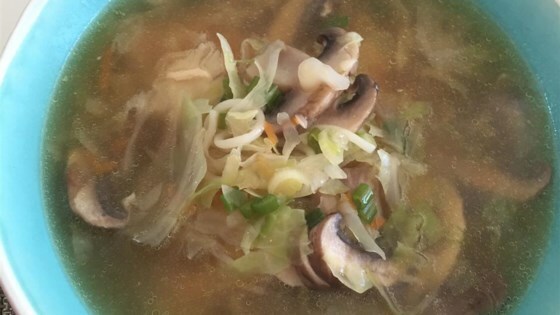 "A touch of East Asian in this soup, hope that you will like it as much as I do." Using a large skillet or wok, heat oil over medium-high heat. Add cabbage and pork; stir-fry until pork is no longer pink inside, approximately 5 minutes. Stir in ginger. Add chicken broth and soy sauce and bring to a boil. Reduce heat to low; simmer 10 minutes, stirring occasionally. Stir in onions and add noodles. Cook until noodles are tender, 2 to 4 minutes more. I wasn't too impressed with this recipe. Although it was easy to make, it lacked something. I added a few drops of sesame seed oil, and that helped a little. Add less noodles then recipe calls for. This soup was great!! My whole family loved it. I will definately make it again, especially on a cold day. Thank You! Simple, easy, delicious recipe. I added slivered carrots for more veggies for the kids. My 9-yr-old loved it and wanted leftovers in his thermos for lunch.